Military, college students, AARP members, AAA members, firefighters and law enforcement get a free coupon book. You can search coupons and special offers by center or by brand and outlet store. In Store: Download their APP, then select "earth day exclusive deal" and show the offer on your mobile device at Tanger Shopper Services for a free $10 gift card. Complete the form and they will email you an exclusive 25% savings coupon valid at participating stores in Tanger Outlets. Get a free $20 Gift Card to use at your favorite brand-name outlet stores. Fill out the form and Tanger Outlet will send you a coupon via email for a free $20 gift card. Choose your location and you will receive a coupon for 25% off any single item at participating stores. Excludes frozen. Make sure you view store locations. Spend $100 or more in soma stores in Tanger Outlets and get a free tote. 4 for $44 All Large Jar Candles (Reg. $27.99 ea.). Columbia Sportswear Senior Discount. Take an extra 10% off your entire purchase. $15 off purchases over $75 at easy spirit stores in tanger outlets. Valid at gap factory stores in tanger outlet centers. Up To 50% Off Throughout the Store. 20% off your purchase of $100 or more. Simply print or show this voucher at Shopper Services to receive your free $10 Tanger gift card with $50 worth of same-day receipts. 40% off entire purchase including New Arrivals! Excludes clearance. Present email at J. 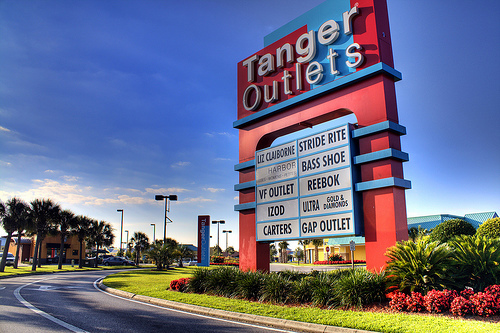 Crew Factory stores exclusively at Tanger Outlets and enjoy an extra 30%. Friends & Family Holiday Event! Enjoy a 40% discount on your total purchase. Valid at Adidas Outlet stores at Tanger Outlets. Must present coupon at time of purchase.